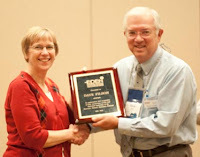 If you weren’t able to attend the 2010 EDEN Annual Meeting, you missed great face-to-face networking opportunities with Extension and agency friends and colleagues. Keynote speaker, Dr. John Gordon of the National Weather Service, set the tone for the meeting. He had a fast-paced, direct and entertaining presentation that highlighted several educational features coordinated by NWS. Fourteen concurrent sessions highlighted work and research on disaster education throughout the country by Extension educators. 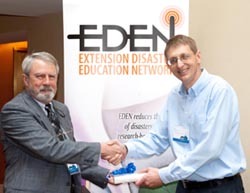 Presenters have been invited to post their presentations to the EDEN Intranet (logon required) under the EDEN Member Resources tab. Program Area Work Groups (PAWGs) and standing committees met to discuss goals and activities for the coming year. If you are interested in joining a work group and/or standing committee, please contact the chair(s). Our capstone speaker, Mr. Jim Garrett, Voluntary Agency Liaison for the Kentucky Division of Emergency Management, brought everything together in a thought-provoking manner. He reiterated the necessity to collaborate and partner with other agencies, and reinforced the importance of what we do. Mr. Garrett also referred to four books you may find to be good reading: Acts of God, The Unthinkable, Edge of Disaster, and Survival. 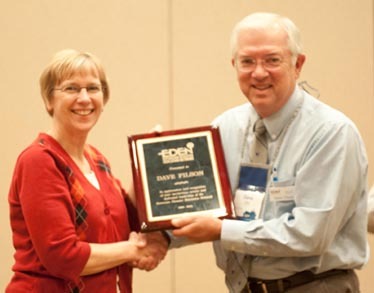 Becky Koch presented a plaque to Dave Filson, outgoing EDEN Chair, in recognition of his leadership. Following the presentation, new officers and standing committee chairs were announced. EDEN delegates discussed and approved the Executive committee’s proposal to pursue formal national collaborations or partnerships. The supporting document for discussion is posted on the Intranet under EDEN Member Resources. EDEN operates using a set of Operating Guidelines that are reviewed annually and updated as required. 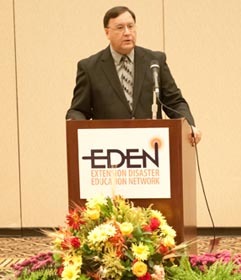 Three important changes were approved at the EDEN business meeting in Lexington. Added retirees to Delegates section: Retirees, with the approval of their POCs or directors, may continue to serve as delegates. No delegate, active or retired, may access EDEN resources for commercial purposes. Revised the Administrative Infrastructure section. The existing paragraph was replaced with: Communications, homeland security leadership, Web development and support are coordinated by a single institution and funded by a grant from NIFA. Since 2002, the cooperative agreement, renewed annually during each 4-year funding cycle, has been between NIFA (formerly CSREES) and Purdue University. Purdue subcontracts with LSU for Web development and support. Executive committee recommends funding strategies to the NIFA liaison at the start of the third year of the funding cycle. Added a partnership statement between The Use of EDEN Name and the Funding sections: The Executive committee may at times enter into collaborative agreement with organizations and agencies that further the EDEN mission. International partnerships and opportunities. Contact Peter Barcinas. Disaster exercise development. Contact Steve Cain or Linda Williams. More and more of our EDEN work is happening on our Intranet. If you can’t log in, you can’t play. Remember, we’ve got two protected spaces and you have to log in to change from one to the other. But, first you have to get in, which means eXtension has to recognize you, and tell us you’re legit! So many ways to get lost — just send Summer Prisock an e-mail and let her help you work through any problems you may be experiencing. Rick Atterberry uses this photo from the National Weather Service as part of this Ready Business presentation. Rick says the photo helps provide quite an effective answer to “Why plan?” The image shows the after effects of an F4 tornado direct hit on the Parsons’ Manufacturing plant in Roanoke, IL July, 2004. Not one of the 140 people in the plant at that moment was hurt. 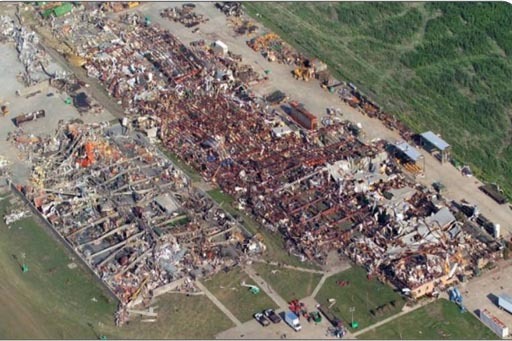 Do you have a disaster photo you use in your presentations that you’d like to see featured here? Contact Virginia Morgan.